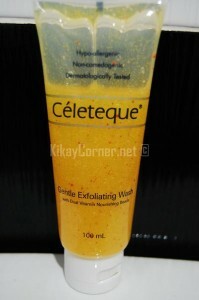 I have been using Celeteque Gentle Exfoliating Wash with Dual Vitamin Nourishing Beads for a while now. In the last two weeks of usage, I have found no unpleasant effect on my skin. When a bunch of Celeteque products arrived at my door step some few months back, I knew I was bound to try one or the other. I decided to try this one first. I love that Celeteque Gentle Exfoliating Wash’s gentle exfoliating effect. I have tried other scrubs before but this one is nothing like the abrasive and harsh kind. Celeteque Gentle Exfoliating Wash with Dual Vitamin Nourishing Beads gently yet effectively cleans and exfoliates while nourishing and revitalizing your skin. Its special sphere-shaped microbeads are designed to gently remove dead skin cells. The dual vitamin nourishing beads are said to be infused with Vitamins E and C. The very vitamins to look out for that help nourish and protect the skin. Just use the wash as you would a regular facial wash, with gentle circular motion. I do not have a sensitive skin. I have tried and experimented with a whole bunch of facial stuff without problems. If you happen to have a sensitive skin and might have pimples here and there, it is best to go easy on anything exfoliating until you are cleared by your dermatologist. Usually, accutane is recommended first. Celeteque Gentle Exfoliating Wash is hypo-allergenic, non-comedogenic, dermatologically tested, soap and fragrance free, pH balance and with anti-inflammatory and soothing ingredients. With all these in the package, I don’t see why anyone with a regular, non-sensitive skin will have issues with it. i am also using it too.